It's an important, life-step decision that I am very proud to have accomplished (albeit later than my childhood peers) and very excited to move from putting money into the black hole of rent to an investment such as a house. The search and purchase of this house definitely wasn't without compromise. My dream home wouldn't be anything big, but it would be on the Atlantic ocean without any neighbours in sight (key word: "sight", doesn't mean I would want a ton of land). 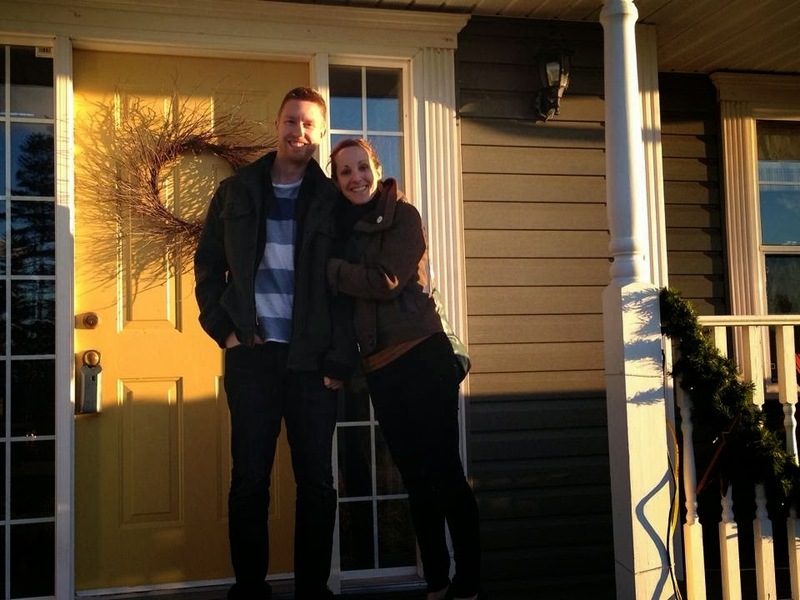 Unfortunately, in order to work to pay the mortgage we'd need to be within commuting distance to the city. And although Halifax is a port city, and it doesn't take long to reach the ocean, all ocean front and even rural-esque land and homes are hundreds of thousands of dollars out of our price range. 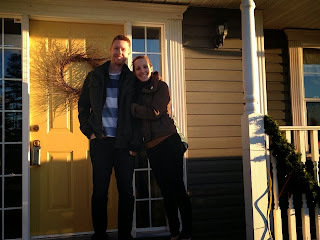 We considered building, since we'd be able to control the level of "eco" home we wanted... and were informed that recent laws in Nova Scotia make it near impossible for first time mortgage-purchasers to acquire a building mortgage. Our compromise in this entire situation: A beautiful, 8 year old home 40minutes outside of the city in a semi-suburban, semi-rural neighbourhood on 1.34 acres of land. We have a well and septic (and a reverse osmosis full house treatment system! ), an oil tank that accepts bio-diesel and bird feeders and deer poop! (re: deer!). The closing date is January 7th 2014, and we're so excited to be picking out energy efficient appliances (those currently in the home are awful, worse than our apartment appliances), low VOC paint options and acquiring Nests (all future blog posts). The downside to this entire experience: the extra-long commute which will add to our carbon emissions, and the necessity of purchasing a second car. Yes, living in the urban centre is better for the environment. And yes, we could have found a condo or small home within our price range on a bus route. Unfortunately, 13 years of living in a city has truly begun to seep all levels of happiness from my life. Having lived for 19 years in a village of 500 people, I explicitly know how much more grounded, happy and connected to Nature I feel when I am living out of the city. A purely selfish reason, however I am a firm believer that life is wasted if a person is unhappy... so what's the point? Another reason for the more rural route: Andrew and I want our children to know nature. Yes, I know it's possible to know nature while in the city... but parks and trips outside the city are not the same as wild, free exploration. A great example of this: our friends from the suburbs of Toronto have NEVER seen the milky way until this summer, while visiting my parents cottage in the middle of the woods. So, although I know there will be those who will judge and condemn us for moving out of the city and being forced into buying a second car, I know it is the best decision for our family. We'll just have to work harder at making our home and lives as energy efficient as possible. Carpooling, buying a low-fuel vehicle, investing in solar panels or geothermal heating, gardening, purchasing carbon offsets... I'm sure our list could grow. The Climate Crusader explains why colder-than-normal temperatures aren't actually evidence that global warming isn't happening. If it's been chillier than usual in your area lately, you're not alone. Cold weather swept across the continent last week, leading to plummeting temperatures and too much snow to handle in many cities across the US and Canada. It's not just chilly here, either. While they're entering summer in the Southern Hemisphere, the coldest temperature ever recorded was recently logged in Antarctica - minus 135.8 Fahrenheit, or minus 93.2 Celsius. When the mercury starts to fall, some people may wonder why it's so cold out if we're supposed to be experiencing global warming. Can climate change really be happening, if we're shivering our way through late autumn? The short answer is Yes. When you're talking about the impact of climate change, it's important to understand the difference between the climate and the weather. The weather is what's happening right now. It tells us about the current temperature, wind speed and direction, humidity level, cloud cover, precipitation and so on. 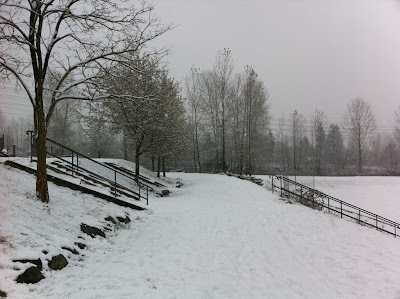 The climate tells us about the weather patterns in an area over a longer amount of time. It tells us things like what the average temperature and precipitation accumulation are in a specific place over several years, decades or centuries. Of course the weather is colder in the winter than it is in the summer. And of course, we sometimes see temperatures that are unusually cold, just as we sometimes see temperatures that are unusually hot. Taken by themselves, they don't tell us how the Earth's climate is changing. Only measuring trends over time can tell us what's happening, and help us to predict what may happen in the decades ahead. Those trends are very clear: the average temperature on our planet is rising, and there's a strong scientific consensus that humans are causing it. 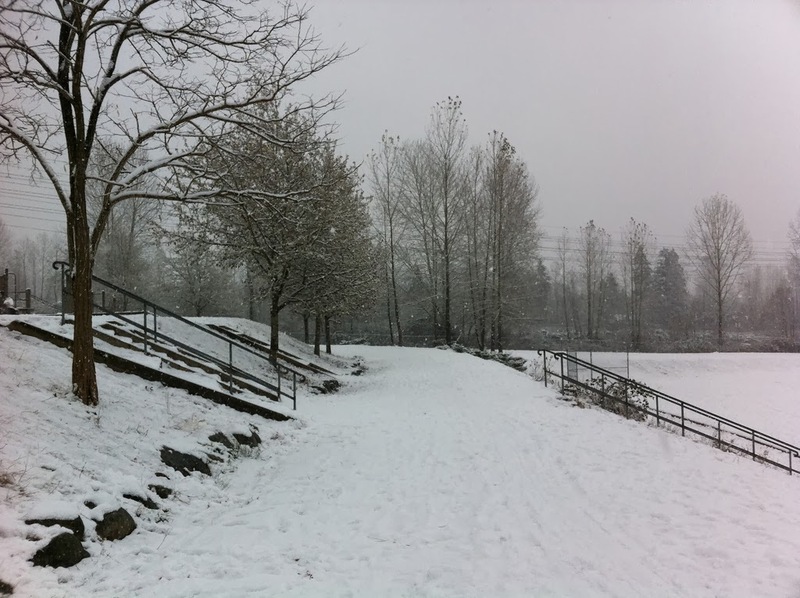 While the idea of global warming may sound appealing on a cold winter day, the evidence is pretty strong that it's actually not a good thing for plants, animals and people. It's important that we don't become complacent, just because it isn't warm out today. Mindful Echo is weighing her arbor-ous options. Confession: I have never had a real Christmas tree. gasp! Allow me to explain. As I mentioned in my last post, my birthday is in December. When my parents were first starting out, they were more concerned about supporting a baby on the incomes of a schoolteacher and a grad student than there were about doing it up big for Christmas. Still, my father wanted to do something special so he purchased an artificial tree for $10 (a big expense for them at the time) and on Christmas morning wrapped up my baby self with a bow and put me under the tree. 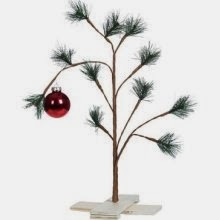 Blah, blah, blah, the sentimentality of the tree stayed with my parents for YEARS and, though it's a sweet memory, we celebrated every season under the slanted, sparse branches of that tree that wasn't even fit for Charlie Brown's living room. It wasn't until I was in high school, when a friend commented on how tiny it was, that it really occurred to me that it was a sad looking tree. Still, in the greater scheme of things, the size of the tree and it's pathetic acrylic and aluminum branches were still fun to decorate with homemade ornaments and strings of garland. Since then I've always had an excuse to skip having a tree- despite the fact that I ALWAYS decorate. Every year I've either been travelling or just not had the space to justify something big. I'm currently living in around 800 sq ft with my partner, our dog, and two cats. We technically could make room for a tree...but that's were the problem really arises: to go fake or au natural? Chopping down our precious trees for decoration is harmful to our forests! Purchasing plastic products for decorations unnecessarily supports the evil oil industry! It seems to me that the best decision would be to use a living tree, one with the roots still in tact. That way it can be replanted after the holidays. I'm not sure I have room for that this year, but it's a great idea! What are your thoughts? I'd love to hear which side you take. Leave a comment and let me know how you picked your tree this year. I embarked on this holiday season as a bit of a scrooge. Even though we've tried to limit buying for years, our house still bursts at the seams with stuff. I still spend hours every week cleaning stuff, organizing stuff, decluttering stuff and so on. As we dragged down boxes of holiday decorations and I began, once again, arranging stuff, I wanted to scream: NO MORE STUFF! It's not just my family and its not just Christmas. The world just does not need any new stuff. Our forests, oceans and skies are depleted yet our landfills are full. Instead of busting down doors for the newest gadget, we need to learn to reuse what we, collectively, have. 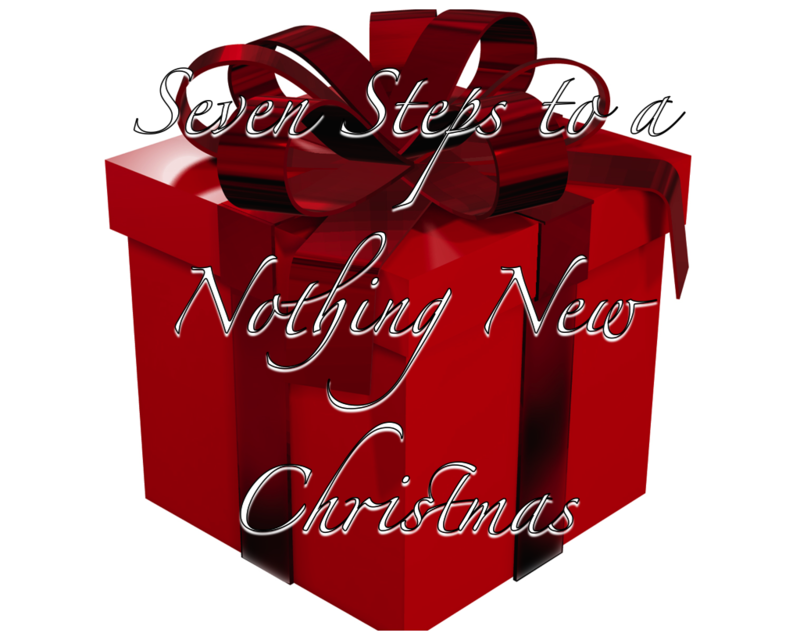 Enter my Seven Steps to Nothing New Christmas. 1) Switch to a White Elephant Gift Exchange: Five years ago, my extended family moved from drawing names to a White Elephant exchange. The rules are simple. You can give something you already own or you can spend up to $15 on something new (almost always consumables). This switch has ignited our family from ho hum holidays to laughter and tears. No one dares skip a holiday gathering for fear of missing out on the event. The trash talking starts as early as September: "Ohhh, wait until you see what we're going to give this year." "I hope no one saved that hideous clown picture from last year." The exchange, itself, is a raucous event with pictures taken, gifts snatched and memories made. 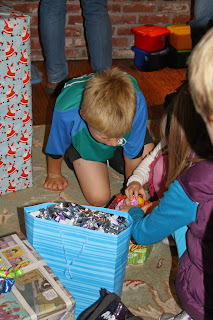 Here are the kids last year, starting their own White Elephant exchange. 2) Shop Your Closest and Save Your Clutter: I declutter on a regular basis but before I list items on Freecycle or haul them to the local thrift store, I cull out the nicer items - things that are new or nearly so, high quality vintage or handmade goods and so on. For instance, a good friend very much wants a marble rolling pin. I have one that I've been meaning to let go. Gift match made in heaven! 3) Shop Second Hand: Whether looking to reduce one's footprint or sustain one's bank account, giving used gifts is officially "in". Antique stores are a classy route but thrift and consignment stores are, in my opinion, totally legit. Many items are new, in the package, or like new. Don't forget garage sales, eBay and Amazon (used books) as well. Beyond scoring some really sweet finds, it is important to support second hand retail outlets. Our town just lost a treasured antique mall due to increased rents. If the demand was higher for pre-loved goods, we might have more space in our landfill. 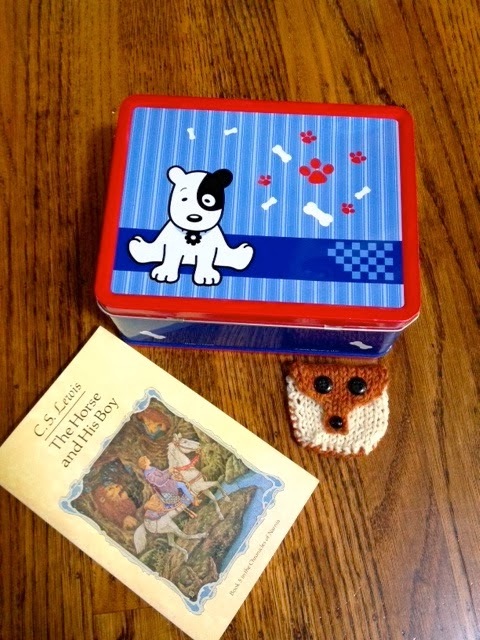 My niece's gift: a book she requested from a library sale (brand new condition), a thrifted lunch box to wrap it in and a fox coin purse handmade from scraps. 4) Make Your Own Gifts: I've been busy knitting for my kids and their cousins, all with yarn that has been clogging up my closet. It's a win win because I'm decluttering while creating meaningful items for people I can about. As onerous as this sounds, I've opted for small and simple - picking quick knits rather than projects that take months to put together. Here is my answer to the "Collect Them All" little plastic toys that my kids always want. Each of these stuffies only took a couple of hours to knit. 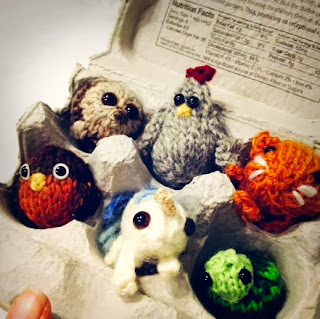 I made them all from scraps and they fit perfectly inside a repurposed egg carton. 5) A Garden of Gifts: If you, like me, are a gardener, your yard is a shopping mall full of gifts. While the flowers are mostly gone by now, I do still have some citrus, greens and herbs - any of which would make a lovely hostess gift. With more planning, I could also be giving propagated plants and collected seeds - not only unique gifts but ones that encourage planting of natives or heirlooms in a world badly in need of biodiversity. 6) Can You Can Can? : If yes, you can give some of summer's canned goods. Jams, preserves, jellies and pickles are all special gifts and can be combined with garden gifts in a second hand basket for teachers, co-workers, friends. If you bake, a loaf of pumpkin bread or persimmon tea cake or such would also be a wonderful addition. 7) Couponing for Good: Finally, give future favors. Personally (hint hint! ), I would adore coupons for babysitting, a cooked meal, cookies of the month, cut flowers from your garden in the summer. You get the hint - or at least I hope you do. Here are more thoughts on how to give used items as gifts. So far, my nothing new Christmas is going exceedingly well. Consumables aside (because what is wrong with farmers' market olive oil and honey! ), I'll probably only end up with a couple of new new gifts . . . and I'm feeling a whole lot less scroogey. Queen Composter is looking for ways to make green choices easier when shopping. I regularly visit the Environmental Working Group’s websiteSkin Deep to research the safety of the personal care products I may purchase. I particularly like their safety reviews of sunscreen products. 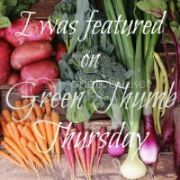 Like many people, I am so frustrated with having to research the ingredients of everything I buy, which is why I have tried to eliminate the commercial products I buy as I gradually learn how to make my own with safe ingredients. There are still some products that I buy, and some that I buy when my homemade items run out, and I appreciate Skin Deep when I need to research which product has the safest ingredients. I have found it inconvenient, however, when trying to access the website on my smart phone while out shopping. 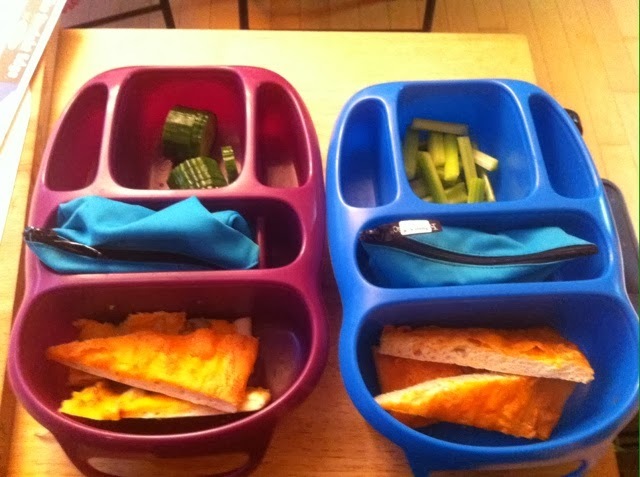 I am wholly reliant upon and addicted to my smart phone, and I am a stereotypical mom using her smart phone for shopping lists and organizing her kids' social calendar. When I discovered that Skin Deep has a free mobile app, I was naturally excited and looking forward to trying it out. The mobile site works in much the same way as the website. Products are rated according to a hazard score, with 0-2 being low risk (green), 3-6 being moderate risk (yellow), and 7-10 being high hazard (red). There is also a data score ranging from none available, through limited, fair, good and robust. 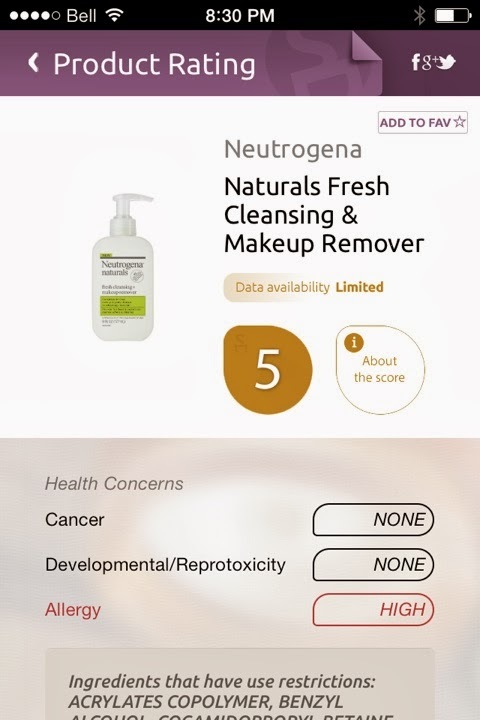 If a product has a hazard score of 1 but the data is limited, it means that the known ingredients have a low hazard but there is little known of the other ingredients (very few products on their website have a data score of robust). Both the website and mobile app include a breakdown of the health concerns of the product, although the mobile app edits the information from five areas to three (cancer, developmental/reprotoxicity, allergy). The app has the option of scanning the barcode or typing in the name of the product, and it is here that I had my first difficulty with the app. 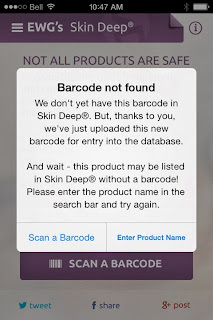 I love the idea of quickly scanning the barcode to access the product information, but for the majority of products scanning did not work for me. Another issue I had was that after typing in the product name and reading the data available, I was unable to go back to the previous screen to search other products as the app seemed to freeze. The only way around this was to close down the app and restart it each time, which is frustrating to say the least. Obviously the website has many more available options, such as searching by category (sun, makeup, skin care, hair, nails, fragrance, oral care, babies & moms, men’s) that the mobile app does not, and that is to be expected. The app is limited to searching for a specific product, rather than browsing through various products, displaying the highest rated products first as the website enables users. Definitely not a product that I purchase! Despite the flaws and glitches in the app, I am happy to have the app for quick checks when I am in stores and needing to make a quick decision. I will still use the website to do more research before going shopping, but I can see situations when the app will come in handy. For example, this summer I left my sunscreen at home and I ran into an unfamiliar store on our way to the beach to grab some. My preferred sunscreen was unavailable and I tried to use the website on my iPhone to much consternation. The mobile app would have been very useful to help me make a quick decision. 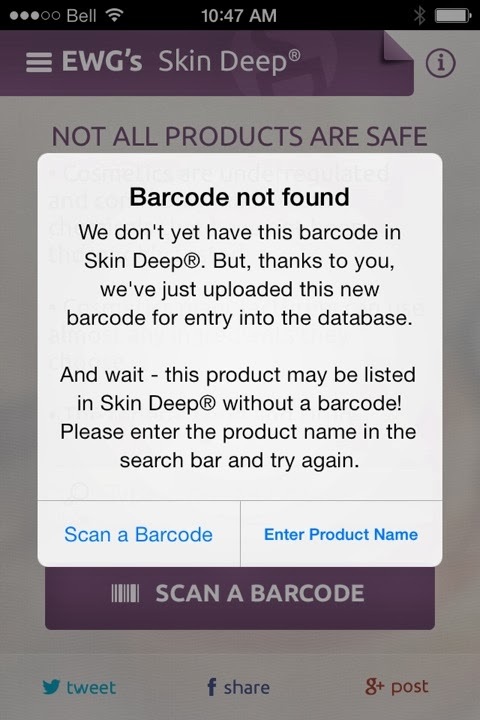 I will be keeping the skin deep app on my iPhone to use in conjunction with research I do on the website. I just hope that the glitches in the app are worked out in a much needed update. For another app review, read Mindful Echo's review of Buycott. The Climate Crusader is an avid tea drinker, but recent news about potential toxins lurking in her daily cuppa have her thinking. I am a tea hoarder. As of today, I have 34 different kinds of tea in my tea cupboard. That's a lot of tea. It shouldn't be surprising, then, that I drink a lot of tea as well. I've never been able to stomach the taste of coffee, so tea is my hot beverage of choice. I drink all kinds ... white, green, black, oolong, rooibos, herbal, fruit infusions. I rarely meet a tea I don't like. This summer, however, I noticed some news reports floating around that caused me concern. FoodBabe posted an article called Do You Know What's Really In Your Tea? Apparently, conventionally-grown teas often contain pesticide residues, which don't really sound all that appetizing to me. In addition, many tea brands contain catch-all ingredients like "Natural Flavors" or "Artificial Flavoring", that can include a whole lot of things, many of them not so good. As if all that weren't enough to turn you off your afternoon cup of tea, there may be nasty stuff hiding in the material the tea bag is made of. Many higher-end tea brands use silky-textured sachets, which are made of plastic, PLA (plastic made from organic substances like corn starch) or food-grade nylon. 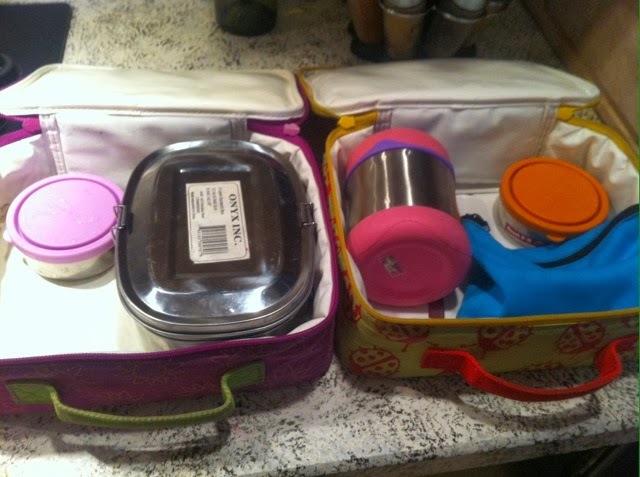 Plastics are known to leach chemicals into food, especially when heated. Like, say, when you pour boiling water over your tea bag. Sadly, paper tea bags may not be any better, as the paper is often treated with chemicals as well. FoodBabe isn't alone in sounding the alarm, either. An article posted to a New York Times blog discusses how lead has been found in green tea leaves, especially from China. While the article does point out that the lead doesn't migrate from the leaf to the tea, I still don't really like the sound of that. Dr. Mercola also raised some concerns around green tea on his site. Buy organic - In order to be certified organic, tea, like other food products, can't be grown using pesticides. It also can't contain genetically-modified crops, or artificial colors and flavors. Choose loose-leaf - By choosing a loose-leaf tea, and brewing it in glass or stainless steel, you can avoid any chemicals that may be lurking in your tea bags. Buy local - Even before reading this article, I'd started shopping at a local, independently-owned tea shop. They blend their own teas in-house, and carry many organic teas, so I can know exactly what I'm getting. Plus, I feel good about supporting a local business. If you're feeling more ambitious, you can even blend your own tea. You can find out how to do that in this Green Phone Booth post. And bonus points: specially-blended teas in pretty glass jars make excellent (and affordable) holiday gifts. Are you a tea lover? Are you concerned about chemicals in your tea? I'd love to hear your thoughts!